It’s often said that a good film score is one you don’t directly notice, but in Raging Bull and The Godfather, the music is front and centre. What links the opening of Martin Scorsese’s 1980 film Raging Bull and the climax of Francis Ford Coppola’s classic Godfather film trilogy? The answer is music – specifically Italian opera. Both film sequences use the orchestral Intermezzo from the 1890 hit opera Cavalleria rusticana, by Pietro Mascagni. The misty, atmospheric, slow-motion opening credits of Raging Bull, with the accompaniment of Mascagni’s music, turns Robert De Niro’s practice sweeps and bounces into artistic choreography – the grace of the boxing movement is stripped of the aggression of the fight. The long and lyrical melody on intense strings is not at all what the boxing film cliché would lead us to expect: it’s definitely no Rocky, and no ‘Eye of the Tiger’. 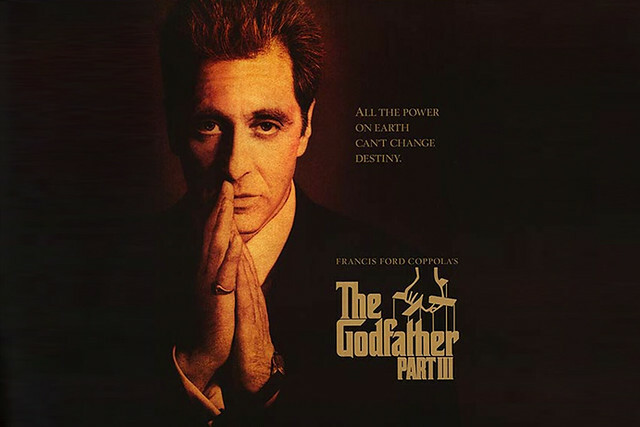 Near the end of The Godfather: Part III, a series of carefully coordinated revenge killings are shown taking place in various locations as the New York-Italian Corleone family – headed by Mafia boss Don Michael Corleone (Al Pacino) – watch a performance in Sicily of Cavalleria rusticana, notably its famous chorus number of the Easter Hymn. As they leave the opera house in Palermo, the action culminates in the attempted shooting of Don Corleone himself. Instead, his daughter Mary, played by Sofia Coppola, is gunned down in front of him. In slow motion, to the music of the Intermezzo, we watch the Corleone family panic and duck for cover on the steps, their faces shocked by the awful realization of what has happened. Here the slow motion isn’t to bring out the grace of the movement, but to create an intense focus that suggests time almost standing still. The big tune of the Intermezzo becomes the sound of an unnaturally drawn-out scream. The camera focuses on the open mouth of Don Corleone, the expected sound of animalistic agony replaced by the painful passion of insistent orchestral strings. Exactly the same piece of opera music in two films has completely different emotional charges. The link is Italian opera itself. The heart-on-sleeve directness of Italian opera has long been its great selling point. People go today for its unique mixture of dramatic story heightened by powerful, tune-packed scores. Film scores use music to underpin the scenes: it’s often said that a good film score is one you don’t directly notice. But in Raging Bull and The Godfather: Part III the music is pushed right to the front of what we notice – just as it is in opera. It shapes vividly how we respond to what we see and feel. Plots based on crimes of passion, jealousy, betrayal, revenge killings and curses became inextricably linked with Italian opera. Audiences still hear that musical sound and know straight away that they are watching intense drama in wound-up families where all that tension is just dying for an explosive release in one way or another. For a film about the Mafia, Italian opera was the ideal match of sound to emotion to drama to audience. But more than this: director Coppola knew his opera and credited the ideas of jealousy and revenge in the Godfather films as directly inspired by Cavalleria rusticana, whose vendetta intrigue in Sicily was a key source. It is only with the conclusion of the last film that he made this completely explicit, even to the extent of Corleone’s son Anthony rejecting the ‘family business’ for a career as an opera singer. The Corleones may be New York Italian Mafia, but where else would Anthony make his debut than in Palermo? As Michael Corleone says ‘We’re in Sicily. It’s opera.’ The Godfather story ends up where Mascagni’s opera started. Cavalleria rusticana, which had its premiere in 1890, is often performed with another short opera written in the wake of its huge and immediate success, Ruggero Leoncavallo’s Pagliacci, from 1892. Both operas are set in small southern Italian villages. Both show tight communities disturbed by increasingly exposed tensions of love, betrayal and revenge. In The Royal Opera’s current production, Italian director Damiano Michieletto makes the most of this, setting them both in the same village. It’s the same community that witnesses the grief of a mother who sees her son killed in a vendetta over a girl, and the horror of an actor who murders his wife during a performance in the village hall because of her infidelity and his uncontrollable passion for revenge. And of course that famous Intermezzo is there too – summing up in concentrated form what has made these two Italian operas – and the whole world of Italian opera they represent – so popular and so enduring. Cavalleria rusticana/Pagliacci runs 29 November 2017–13 January 2018. Tickets are still available. It is a co-production with La Monnaie, Brussels, Opera Australia and The Göteborg Opera; and is supported by Clos19 with generous philanthropic support from Mikhail Bakhtiarov, The Connoisseurs' Series and the Royal Opera House Endowment Fund. Verdi is the master of musical cinematography. Witches or Padre Guardiano. Always writing music as Stephen King would paint with words, or as the actor Kathy Bates would play honest layers in a character.